Much to my surprise… I found out I was a featured artist at Imagekind today. A very nice surprise indeed! I wonder how many folks will check out my galleries? 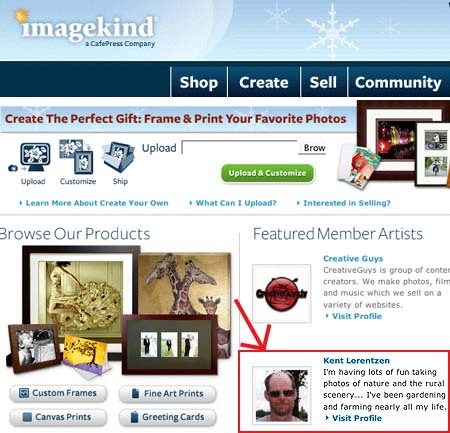 Gee… I feel almost famous, getting my profile listed at Imagekind! This entry was posted in Pictures, Web activity and tagged Imagekind, photography. Bookmark the permalink. Really hoped this gave you a nice boost – I’ve had an imagekind profile for sometime, but am still waiting for my turn! Thats a great honor to be the featured artist on ImageKind. I just joined up with the site, looking forward to my turn too!